New PercyJackson Movie Posters.. EPICC! Im sooo exxcited to seee this moviee! 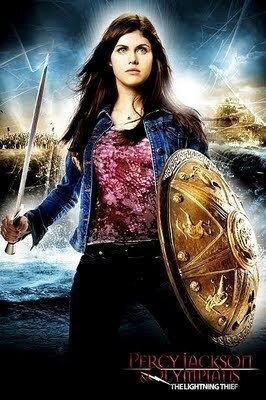 Yes, i know Annabeth isnt blonde, but it's just haircolor and the movie will still be great regardlesss. :). Wallpaper and background images in the Percy Jackson & The Olympians पुस्तकें club tagged: percy jackson lightning thief movie. What do movie producers not understand about BLONDE hair? It only was said half a dozen times in the first book alone. I didn't agree with the casting at all. Columbus did a fairly good job on the first 2 Harry Potter movies, but Annabeth and Grover are two of the main characters and he didn't even get their looks right! Seriously, read the books next time. IF YOU'RE GONNA MAKE A MOVIE READ THE BOOK! SHE'S SUPPOSED TO BE BLOND!!!!!!!!! Wow that STUPID she BLOND what do they not get about the word BLOND if they wanna use her for Annabeth atleast get a wig!!!! She is BLOND and she uses a DAGGER not a sword! if she look good witj armor off is she cute with clothes off? oh yeah they messed up shes blond! I HATED the movie!!! They messed up on EVERYTHING!!! They skipped parts! UGH! Get it RIGHT actually! I mean, COME ON! If you're making a movie 'bout a book this AWESOME and all, read it and actually go in order maybe! I'm gonna stop there. U get where I'm going with this... GEEZ! STUPID MOVIE MAKING PEOPLE! I HATE HOLLYWOOD!!! I WOULD HAVE DONE A BETTER JOB!!!!!!!!!!!!!! and yeah AnnaSophia Robb would've been an AWESOME Annabeth!!!! WHY IS HOLLYWOOD SOOOOOOOOOOO STUPID!!!!!!!!!!!!!!!!!???????????????????­???­???­???­???­? if they get someone not blonde they should've dyed her hair!! !i hate the director and the producer and the script writer!!! !they shoul've read the book not just make the movie...look at harry potter it's successful they only changed a bit not the whole hell of it!!! List of everything wrong with the movie: 1 Grover dose not have cruches,2 Annabeth is blonde 3 Whats with the freaken arch way. what about the tree 4 Hades. No Ares(I was looking forward to him.) No Clarisse. Bam your a son of posidon. Luke is almost ok missing dragon scar. Stupide movie makers leave out the funny parts. Senese when were the looking for perls.Movie is A Maga Fail. Hollywood jacked up big time. Ok seriosly ? I mean come on ! Yeah she is not blond and they mesed up pther charecters and sure that wasn't the real story but GET OVER IT!What do you want? The movie to be the same as the book?Nothing to be changed? ?What's fun in that?I got tired of every1 complayning!If it was the same as the book it woud be boring!I'm not saying the book is boring (It's AMAZING!!) but thath you will know what's gona hapen and it lon't be interesting!The movie is just a version of the book , how the people in hollywood see it! And I thing it was a great movie!And if you don't like just shut up and forget it ok? 'cuz you're acting stupid right now! !